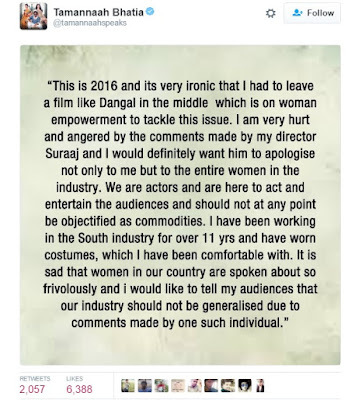 Actress Tamannaah Bhatia was recently forced to walk out of the screening of Aamir Khan’s Dangal in order to offer a befitting reply to a sexist remark made by her director Suraaj. The director had made a shameless remark in a video interview stating that actresses are supposed to wear short dresses in the movies. He also commented about how he always instructs his costume designers to stitch the heroine’s clothing shorter than knee length irrespective of whether the heroine is comfortable or not. Suraaj had made these callous remarks with reference to his movie Kaththi Sanda that stars Tamannaah. When Tamannaah learnt about the director’s sexist remarks she got so furious that she left Dangal’s screening halfway in order to teach a lesson to Suraaj. Tamannaah was in no mood to spare the director. She subsequently took to Twitter to post a long reply that put Suraaj to shame. She didn’t mince her words and straightaway demanded an apology from the director. She also made it clear that during her 11 year career in the South industry she has only worn those costumes that she has been comfortable with. She also attacked Suraaj for objectifying and demeaning women. Actress Nayanthara too came out strongly in Tamannaah’s support and questioned the director’s sick mentality. She also said that the modern audiences are far more mature and dignified than irresponsible individuals like Suraaj who look down upon women. 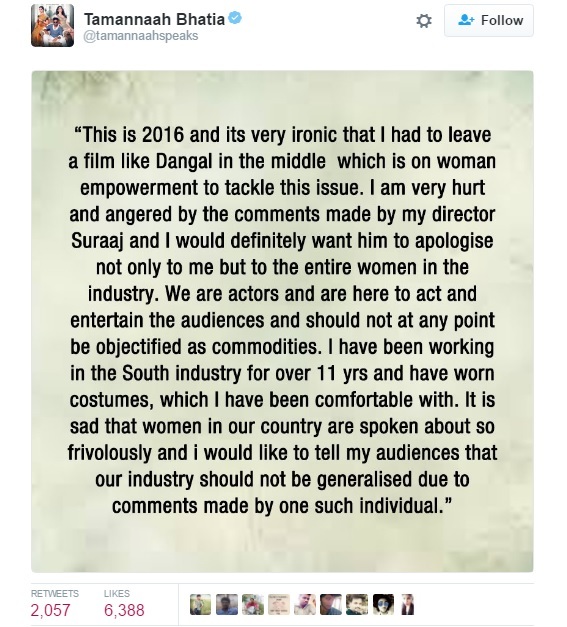 Director Suraaj finally buckled in and offered an unconditional apology to Tamannaah as well as other heroines in the industry for his sexist remarks. But is the apology enough? It is really revolting to see responsible people from the industry stoop so low and demean women at a time when films like Dangal and Pink are trying to lead us on the path of equality and emancipation.